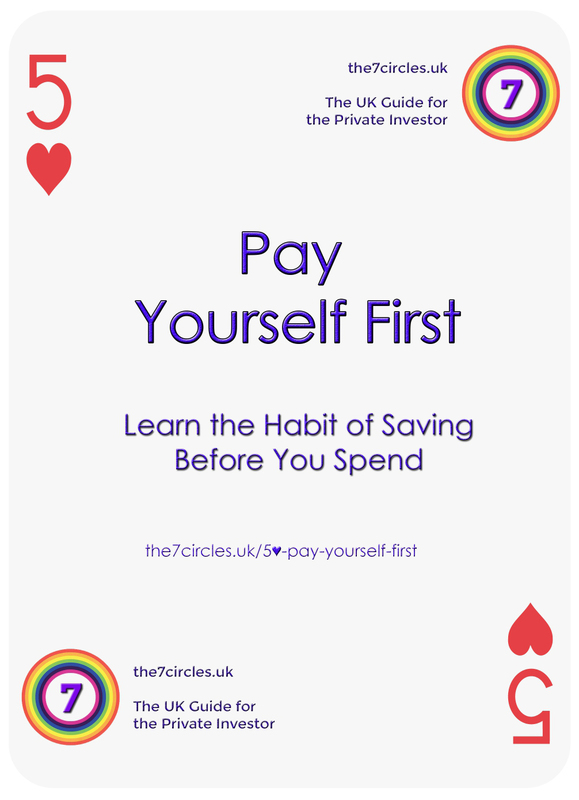 Pay yourself first – learn the habit of saving before you spend. Pay yourself first is an old concept in investing. It’s recommended by everyone from Warren Buffett down. It’s often referred to as the Golden Rule of Personal Finance. Some people find saving easy, but others give into temptation (or advertising) and spend more than they need on treats and toys. Instant gratification feels better than saving for the future. The data seems to agree. Last month the UK savings rate hit an all-time low of 3.8%. That’s not even a fifth of the 20% of earnings you’ll need to save to have a comfortable retirement. Like a lot of things in investing, the way to deal with emotions and psychological biases is to use rules and habits. The idea behind paying yourself first is that you automate your savings so that they come out of your paycheck first every month. Before you pay your bills, your mortgage or anything. Strictly speaking you’re paying your future self, but that wouldn’t sound so catchy. If you pay your (future) self first, then you don’t have the opportunity to cheat your (future) self. If you pay yourself last, there will always be some pressing reason – a trip abroad with your friends, that new gizmo you’ve wanted for, oh, weeks now – why you can’t afford to pay yourself this month. And if you don’t get into the savings habit early, you’ll find it much harder later on. You’ll never meet anyone who didn’t wish that they had started saving sooner. The positive feedback you get from watching your savings grow will also be a powerful motivator to keep you saving. If you’re used to saving first, whenever you get a pay rise, or some extra income, you can add it straight to your savings. You’re mentally establishing saving as a priority in your life. You’re fostering a high self-worth – you deserve to be paid first. And your future is important. It’s like they say on the planes – put on your own oxygen mask before attempting to help others. You have to learn put yourself first, because nobody else will. You have to save for your future, because nobody else will. Pay yourself first is boring, but it works. Or – if you are a passive investor – you can go the whole hog and set up instructions for which funds and trusts you like the money to be invested in. If you have a workplace pension with matched payments from your employer, don’t forget to make those contributions first, to take advantage of the free money. Following the government’s auto-enrolment drive, most of us apart from the self-employed will soon be in this position. Before you can start to pay yourself, you’ll need to look at your current spending and work out a monthly budget. Then make arrangements for whatever you make on top of that to be transferred out to your SIPP or ISA (or employer pension scheme). Hopefully that amount is what you need to contribute to make the goals on your financial plan. If not, you need cut your spending (take a look at our posts for our ideas on how to be frugal) or up your income until it is. Then you can forget about it. You’re saving without noticing, and without any pain. Review all your expenses to see if you can make this number bigger. Work out a savings plan to reach your goals, and calculate how much you need to be putting away each month. Compare the amount you need with the spare money you have. Make arrangements for the money in the SIPP / ISA to be invested into you preferred assets. So remember, Pay yourself first – learn the habit of saving before you spend. Previous story Smart Beta – Assets or Alpha? Use Compound Interest - it's money for nothing and a free lunch.